Trained upholsterer, Erik Ole Jørgensen designs furniture and fabrics, including for Kvadrat, and works for Kaare Klint in the 1940s. The simplicity and functionality of his furniture made him one of the best Danish furniture designers. In the late 90s, Erik Ole Jørgensen participates in a number of exhibitions all over the world; he was awarded several prizes. 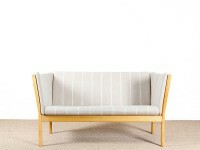 His most famous works are the J149, originally designed for FDB Møbler and produced today by Fredericia Furniture, the Ej 315 sofa currently produced by Erik Jørgensen Møbelfabrik.